A Tribe of One- A Shamanic Healing Handbook for the Modern World is the first book written by Quynn Elizabeth, founder of the Institute for the Shamanic Arts. 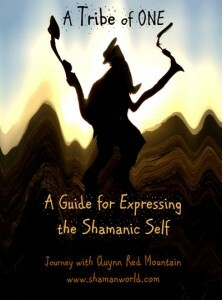 Written in 2004, this helpful handbook allows any person to learn how to utilize shamanic techniques for self healing and soul exploration. “In order for us to see through the spell, the ‘matrix’, the veil that has been cast upon our minds for the last 20 generations, we must cast off the beliefs of that system. It is time for each of us to wake up and realize in which ways we are chaining ourselves to the world that has been created for us. If there is one thing that our modern mind is beginning to grasp, it is that ‘reality’ is more than we once thought. Certain people in the past thought that the sun moved around the earth and that white men were more ‘human’ than the rest. Modern society holds many beliefs that are similarly antiquated and they should be discarded like old dirty and disease ridden blankets.